On September 16, a 4-person Virginia Varsity team took part in the 2nd annual Muddy ACCE Race in Glen Lyn Town Park. The 25+ obstacle, 5K race began with a heart-stopping, artic ice bath, but this was just the beginning. 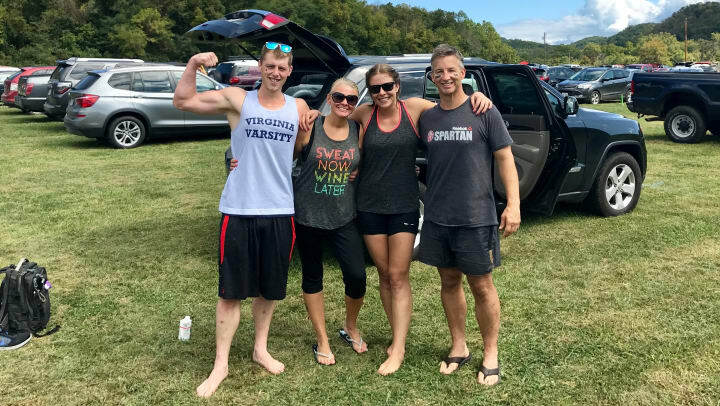 The team had to navigate a slip wall requiring teamwork and great personal sacrifice (especially for Jim), trudge through mud bogs and over muddy slopes, scaled countless walls, and faced numerous other challenges before the race mercifully ended with a rope swing into the chilly New River. The event was great fun, and the group enjoyed being a part of something so physically challenging, yet in support such a good cause. Check out our Facebook page for pictures!